The 6-year-old version of myself was amped! I was about to head to my first-ever New York Mets game at Shea Stadium in Flushing. Earlier childhood photos show that I had in fact been to Shea Stadium before – but it was for a live performance of Barney and Friends! This time, however, in the spring of 1995, I was going to watch a baseball game. Now mind you, my devout Mets fandom had not yet been established. Frankly I probably had no idea what was going on that day. But when I left the stadium that night, two things were certain: I had my vintage Mets bobblehead in hand, and I had a new favorite baseball player – Mike Piazza. Piazza at the time was the superstar catcher for the Los Angeles Dodgers. It’s funny that I became a Mets fan but my favorite player was on another team, but there was just something about Piazza that I idolized. My first position in Little League was as a catcher, so maybe that was it. And I seemed to like players who could hit home runs, like Mark McGwire and Frank Thomas. So let’s fast-forward a few years to May 1998. My baseball interest had skyrocketed by that point, and I was feeling a good year from my Mets, who really hadn’t done anything significant since winning the NL East division in 1988… when I was four months old. Don’t exactly remember that one too vividly! Anyway, turns out I hear that Piazza had been traded. I would have loved to see him come to the Mets, but instead the Dodgers traded him to the Florida Marlins in a blockbuster deal that included the likes of slugging outfielder Gary Sheffield, veteran catcher Charles Johnson and Bobby Bonilla – who it turns out the Mets are still currently paying though he’s been retired for 15 years. That’s another story for another column. Just a week later though, the Marlins flipped Piazza to the Mets for Preston Wilson, Ed Yarnall and Geoff Goetz. Talk about highway robbery! Usually it’s the Mets that get swindled in these big trades, but not this time. I believe it was one of my aunts, lifelong parishioner at Immaculate Heart of Mary, Windsor Terrace, Mary DeBernardo, who alerted me of the news. She and I were arguably the biggest Piazza fans on the East Coast, so we were both ecstatic that our favorite player was now a New York Metropolitan. It was Aunt Mary that got me the life-size, six-foot-three-inch cardboard cutout of Mike Piazza, complete with sunglasses and the trendy “Mets in Black” jersey of the early 2000s. I believe that it is still in the family somewhere. 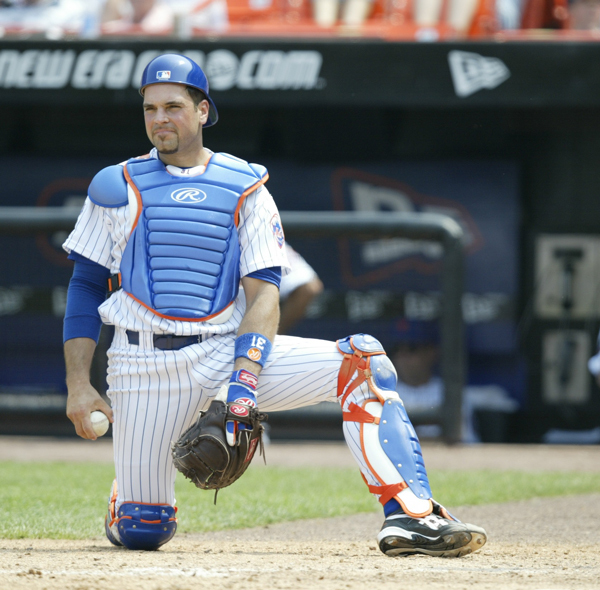 And hopefully it is, because after waiting a few years too many, Piazza is now a Hall of Famer as hands down the greatest hitting catcher of all time. Piazza and Ken Griffey Jr. are set to become the 311th and 312th members of the National Baseball Hall of Fame in Cooperstown, N.Y., as the Class of 2016. The best part about it all is that Piazza will be wearing a Mets cap on his plaque, joining the legendary Tom Seaver as the only players to wear the Mets logo in the hall. Sure Piazza had great years with the Dodgers. That is part of the reason he caught my eye. He was an All-Star every year and put up numbers that would be unbelievable for a first baseman or designated hitter, let alone a catcher, who played in less games and dealt with day-to-day bumps and bruises. But as far as moments that defined his career, those all came in orange and blue. From his dominance of Roger Clemens in the Subway Series, to his come-from-behind home run that helped the Mets overcome an eight-run deficit against the Atlanta Braves in 2000, to his memorable post-9/11 home run that helped heal a city in mourning, and finally to his home run that set the all-time record for catchers in 2004, Piazza was a Met through and through. In looking back, probably my favorite Piazza memory came on Aug. 8, 2006, after he joined the San Diego Padres. The Mets let him go after the 2005 season, and this was his first time back at Shea Stadium. Way before first pitch, chants of “Mike Piazza” filled big Shea. And when he came to the plate in the top of the first inning, he was greeted with a rousing applause. Turns out the next night, Piazza received a rare curtain call as a visiting player when he homered off Pedro Martinez. But after his second home run of the night that got the Padres within two runs, fans weren’t as eager to praise him! There are plenty of other great Piazza memories, and the culmination of those is set for this weekend in Cooperstown. Regardless of how long it took, Piazza is now a Hall of Famer, and that’s all that matters. So thank you, Mike. Thanks for the clutch hits, the leadership, the drive and the passion for the game. But most of all, thank you for being an upstanding Catholic gentleman through it all!